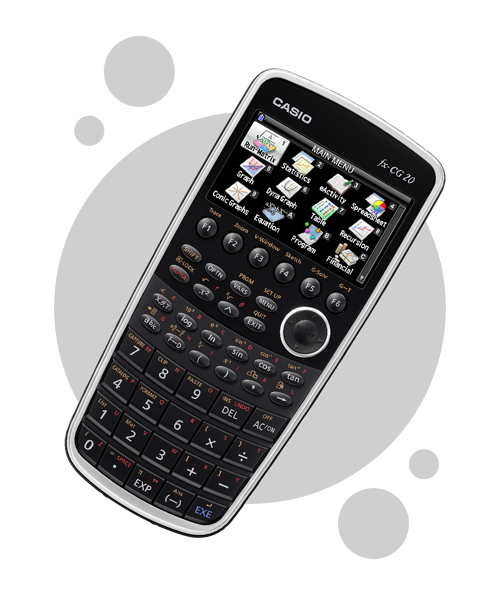 The fx-CG20 is an advanced graphic calculator, with natural maths display on a full-colour, high resolution backlit screen. It allows you to plot and analyse graphs and their transformations, import data directly over USB, plot data charts and calculate statistics, calculate and visualise probability distributions, calculate matrix and vector arithmetic, perform complex calculations not possible on a scientific calculator, calculate spreadsheets and recursive sequences. It can be upgraded to display and solve 3D graphs. Calculate Normal, Binomial, Poisson and t-distributions between values, and chi-square goodness of fit . Visualise continuous distributions (including Normal) as a graph, shading chosen probability. Evaluate matrix arithmetic, including inverses, up to 999 rows or columns. Evaluate vector arithmetic, including scalar and vector products.